Your guests will be over the moon when they see this awesome Battle Spaceship Pinata. This pinata makes the perfect decoration and party game to any Star Wars, Star Trek or space themed party. Pinata measures 21 inches long by 14 inches wide by 4 inches deep and can be filled with up to 2lbs of toys and candy. 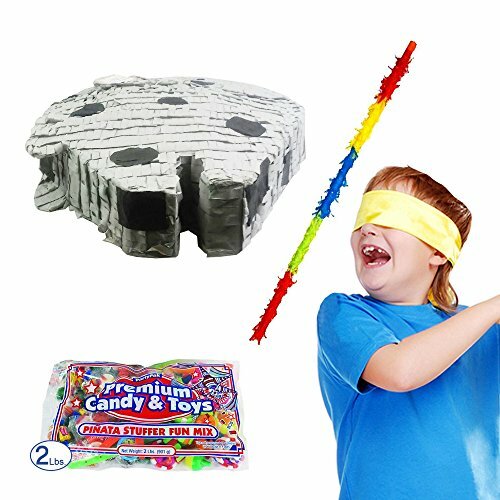 Kit includes (1) pinata, (1) 2lb filler, (1) buster stick and (1) bandana. Pinata filler includes 2 lbs. of Assorted Fruit Barrels, Tootsie Rolls, Jawbreakers-Hot Shots, Assorted Flavor Lollipops, Smarties Packets, Smarties Rolls, Bubble Gum, Fruit Dandies, Bubble Gum Filled Toys and Assorted Plastic Toys. 18 inches long Buster Stick is made of wood and decorated with multicolored fringed tissue paper. Bandana comes in assorted colors (our choice please), measures 20″ by 20″ and is 100% polyester. Use bandana to blindfold player before hitting pinata.